Call of Duty: Black Ops 3 is set in 2065, four decades after the event of CoD: Black Ops 2. in Black Ops 3, you play as part of a prototype black ops unit that was cybernetically enhanced. During a mission, you lose a part of your team and then have to live with the consequences of a massive, military information leaks, which pulls the worldwide collapse of covert operations. Your task will be to find your team and uncover the truth. The campaign is designed to a four-player system, so you can play with your friends in co-op mode - if you don’t want, you can even play the story alone without any problem. Of course there is also a multiplayer and also a zombie mode. In multiplayer you can choose between nine classes, each has special and unique abilities and weapons. In our guide to CoD: Black Ops 3, will give you a summary of all the multiplayer secrets and Zombies mode, Easter Eggs in the Giant and Shadows of Evil, Hidden Secrets multiplayer maps, and comprehensive guides to achieve them. First of all, you should know that the Black Ops Zombies mode 3 is not different from previous ones. To unlock the machine Pack-a-Punch, and then upgrade your weapons, you must complete this Easter Egg Shadows of Evil. And good news is that you can do solo usually after the first six rounds - if you manage your points and your arsenal. There are five items you need to recover, the Summoning Key, Golden Fountain Pen, Badge, Championship Belt and Hair Piece. These items are needed to initiate the 5 rituals. The final ritual unlocks the machine Pack-a-Punch, as useful to your survival! Once you have recovered the three parts, open the second gate of the Waterfront District. There is a set where you can build the Rocket Shield (it only takes a few seconds). You can activate the rocket on PS4 and Xbox One with R2 / RT. This shield is perfect for defending yourself facing large groups of zombies. 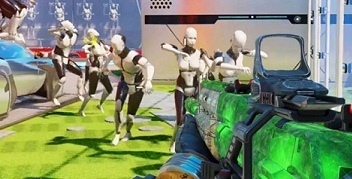 It is the version of Black Ops 3 Nuketown, which hides a terrifying Easter-egg ... or rather cool, while actually depends if you like the Zombies mode or not. To unlock this Easter egg, players in less than 2 minutes off the heads of all the models of the map to initiate the zombie mode. If the handling is done correctly, all players will hear bells taking up the theme of the Zombies mode. This Easter egg is friendly, and is seemingly easy to achieve. Remember, though, that Nuketown 2065 is mainly played in Deathmatch Teams, which therefore makes it very difficult trigger the Easter Egg if you are alone. If players destroy ALL MODELS arm in completely, they will then wake up and stalk the players. As you can seen, the models move only when they are out of view of the players. Turn your back, and you're dead! This is something that could well spice up parties already very intense match to death on Nuketown! Some recognize a nod to the Weeping Angels in Doctor Who or animatronics Five Nights At Freddy's. This is a very nice addition to the game! By completing the single player campaign, you will have access to unprecedented campaign "Nightmare", which will add zombies to the single player campaign! No more endless exchange of shots, place of carnage brainless zombies! You will have access to bonuses, like Instant Death or a power-up that freeze zombies for a few moments. After completing the mission 2, New World, in the single player campaign you will have the opportunity to enter the shelter anytime. In the shelters, there is a data terminal that looks more like a big, very big, computer screen. You can interact with the terminal. Once you use it, press the small button hidden on the top left of the screen. When you press it, you start the bonus mini game Dead Ops Arcade 2. Moreover, by playing it you will unlock a trophy / achievement that usually appears after the introduction of mini game screen. There are 5 Perk-A-Cola machines at the base, they are very easy to find. But did you know that there is a sixth one, a well hidden Perk-A-Cola machine? It can be discovered through a few steps. This machine allows you to have the advantage of Deadshot Daiquiri or Stamin-Up. Of course, it changes from one party to another. To access the sixth Perk-A-Cola Machine, you must link the three teleporters. Once the last one enabled, you will need three monkey cymbals (found in mystery boxes). Then start a monkey on the main teleporter, then use the other three teleporters. Finally, interact with the console next to the CPU next to the Pack-A-Punch, and then press the red button. A laser will be fired from the head of Giant Robot, which will melt the snow in the main courtyard and will reveal the sixth Machine Perk-A-Cola! There are a number of radio stations can be found on The Giant. Each message contains the main characters in the history of the Zombies mode. Some messages will change if you play as Richthofen. Here is where to find these radios! - On the left of the Pack-A-Punch, and then to the right of the writing on the wall. - Inside the drawer of a filing cabinet to the right of the doors leading to the transporter A (testing labs). - Below the left stairs leading to the teleporter A. - Below sandbags just before the bridge leading to the generators of the second floor. - In a barrel in the transporter room B. - On the left of the boiler in the hangar. - On the left at the entrance of the office of Dr. Maxis (to the right of the entrance teleporter C). - On the walkways in front of the barrier transporter C.
Unlock Beauty of Annihilation REMIX" Easter Egg Song! To unlock this musical easter-egg, must be the same process as for the original map Der Riese. What you need to do is interact (square on PlayStation, Xbox X) with three green pots in which there is a brain. Two of these pots are on shelves in the lab animal tests, near the GobbleGum machine. The third pot is in the room of the generators of the second floor, above the shed. Specifically in the room with fragmentation grenades. What's the point? The interest is obviously to create Gobblegums as rare as each other. The rarest being the Perkaholic: consume this gobblegum will give you absolutely all the assets available on a map. But this is the hardest element to be created (because it is ultra-rare by definition). The system is based on a random generation of Gobblegums, within the limits of your Liquid Divinium available. Between moments of gameplay and cutscenes, the video shows how to create Gobblegum factory. - You must first obtain an improved weapon via the Pack-A-Punch. - Shoot with this gun on a small box in the back of the map. If you reach your target, a number of green items will begin to fly through the air. You must then find them in the map and shoot them with any weapon. The order does not matter. - Near the right oven near the testing labs. - In the stairwell of a building outside the map. - In the left cooling system in the room of the generators of the second floor, above the shed. You will need to jump to view. After destroying these parts, Annihilator will be available in the hall of furnaces in the hangar. This is a special weapon, it shall becomes a normal weapon slot.